Alexander T. Wolf is confronted by pigs in THE TRUE STORY OF THE THREE LITTLE PIGS. The first question generally asked about a story is what happened. Who’s telling the story, however, can be just as important. 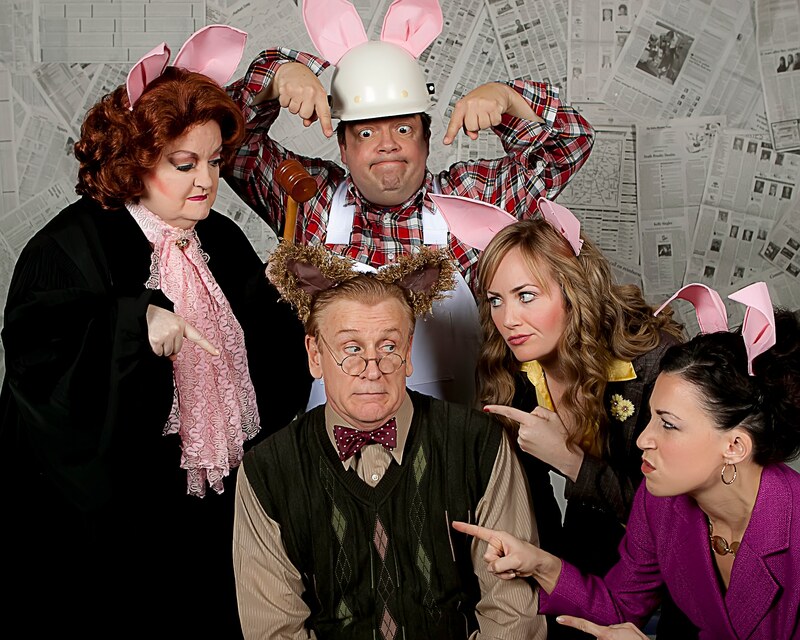 Take John Scieszka and Lane Smith’s The True Story of the Three Little Pigs, a book Dallas Children’s Theater performed in adaptation a few seasons ago. 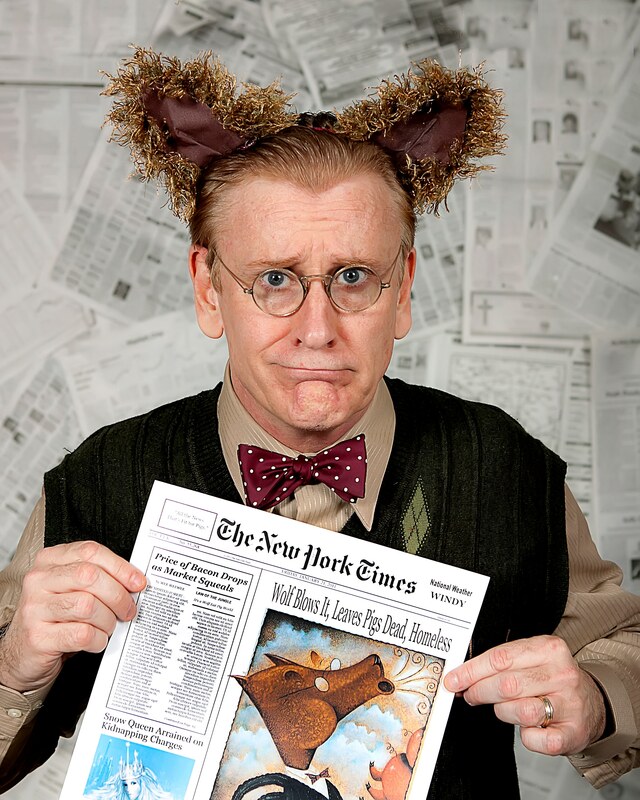 This retelling of the classic tale is delivered by Alexander T. Wolf, a character you may know better as the Big Bad Wolf. From his own perspective, A. Wolf is a mild-mannered grandson attempting to make a birthday cake for his grandmother. After the pigs rudely refuse to lend him sugar for the cake, the wolf accidentally blows down their houses by sneezing (he had a cold, after all!). Obviously, the three little pigs perceived the story differently. This retelling raises several questions related to the storyteller’s perspective: How does the choice of narrator/storyteller affect the impression given of each character? How does the narrative style impact the tone of the plot? In addition to raising questions, narrative perspective can unlock a child’s imagination. For a young person, it can be exciting to see numerous styles of storytelling, particularly when the story is one they already know that is being told in an unfamiliar way. The storyteller involves others through music in MUFARO. You might remember this lesson from English class: a first-person point of view is presented from the “I” perspective (I went to the store); second person is from the “you” perspective (you went to the store); and third person is from the “they” perspective (they went to the store). In books, a third-person narrator is usually an omniscient voice – a voice separate from the story’s characters. In theater, on the other hand, things are likely not as obvious. 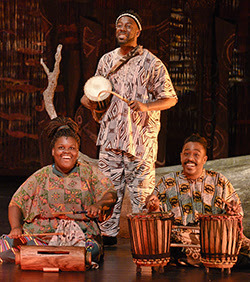 Our most recent production – MUFARO’S BEAUTIFUL DAUGHTERS – features a storyteller who narrates the tale from a third-person perspective. This character reflects the importance of oral culture to African peoples. In most of Africa, stories have traditionally been passed down orally and involve communal participation. Traditional African storytelling can reflect not just the point of view of an individual storyteller, then, but of a whole community. MUFARO’S BEAUTIFUL DAUGHTERS is based on John Steptoe’s book of the same name. The book has one narrator – a traditional third-person voice. Our stage adaptation, though, features a cast of people bringing the tale to life. In a book, it would be difficult to have multiple people tell a story at the same time. In theater, it happens naturally. Helping young minds discover these differences can be beneficial as they grow in their appreciation of both books and live theater. James and the critters encounter dangerous adventures together. Instead of featuring only one voice in the role of storyteller, page-to-stage adaptations sometimes employ a team of narrators. 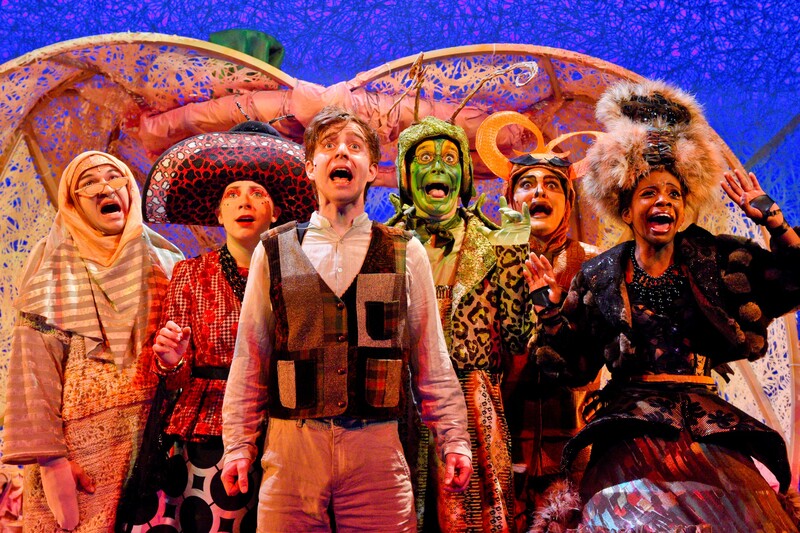 DCT has explored this possibility in the past with JAMES AND THE GIANT PEACH and will revisit this style with THE VERY HUNGRY CATERPILLAR SHOW, which will open in January 2018 and feature multiple actor-puppeteers performing four Eric Carle stories. By reframing the narrative style of these stories, DCT offers children a chance to consider the tales through a new perspective. It takes a village! 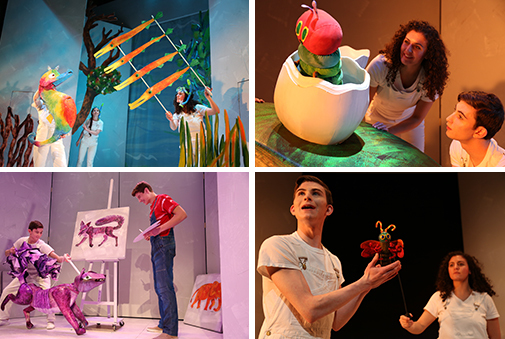 The cast of THE VERY HUNGRY CATERPILLAR SHOW work together to tell four stories. Children learn to express themselves by being exposed to many perspectives and storytelling methods and uncovering the styles with which they best connect. We at DCT believe every child has something valuable and unique to contribute to society. Our stories on stage help them find their voice. Next season, we will proudly premiere a new show about a child finding her voice. 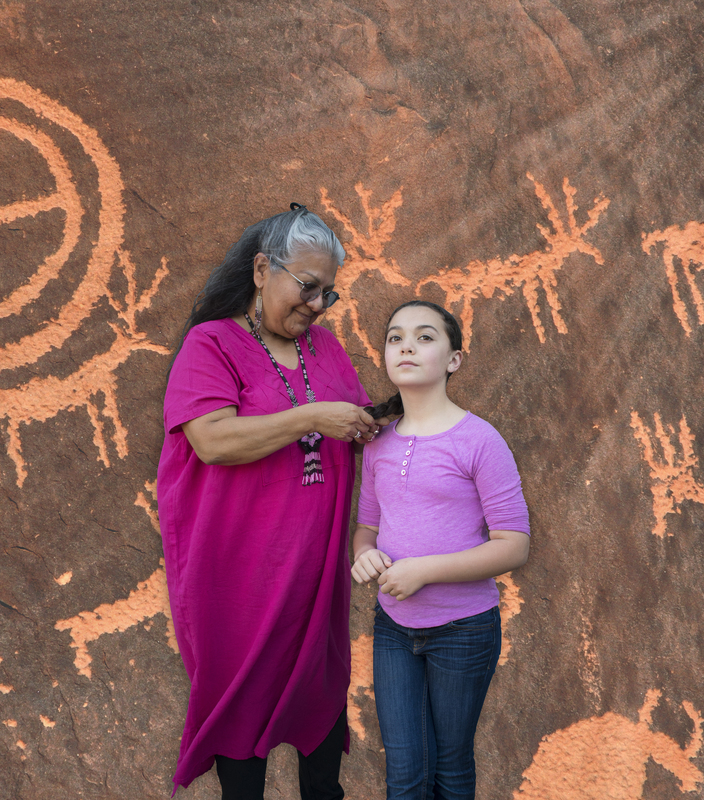 YANA WANA’S LEGEND OF THE BLUEBONNET centers on a young girl who, after hearing an oral tale from her grandmother, begins connecting with her Coahuiltecan heritage. Audiences will witness the character learning the story, adapting the tale for her own school presentation, and applying the lessons of the story to her own life. We believe the play will serve as a great example of the power of storytelling to impact learning and life. What are some of the first stories you heard and told? How might these experiences help you set in motion the stories your children will tell and remember? DCT wants to help you cultivate your children’s relationships with storytelling. We invite you to exercise these ideas at our shows next season. You can reserve your tickets to THE VERY HUNGRY CATERPILLAR SHOW, YANA WANA’S LEGEND OF THE BLUEBONNET, and next season’s other productions at dct.org. If you’d like to know more about traditional African storytelling, visit here!